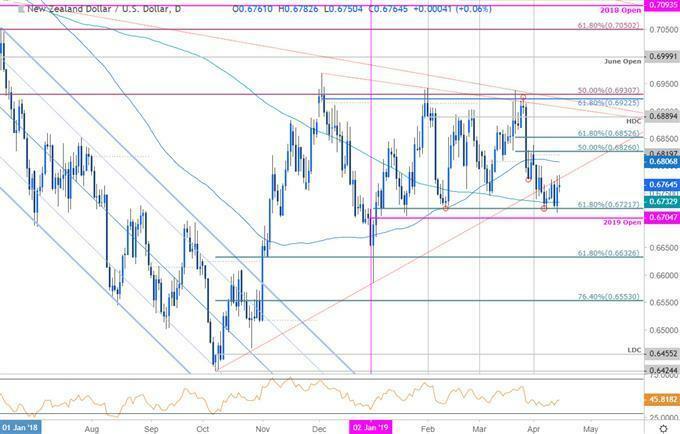 (MENAFN - DailyFX) NZD/USD rebounds from confluence support- bearish invalidation at 6826 Check out our 2019 projections in our Free DailyFX USD Trading Forecasts Join Michael for Live Weekly Strategy Webinars on Mondays at 12:30GMT The New Zealand Dollar is down 0.65% against the US Dollar since the start of the month with Kiwi rebounding off key confluence support late-last week. While the near-term picture allows for further gains, the broader risk remains weighted to the downside after breaking multi-year slope support earlier in the month. These are the updated targets and invalidation levels that matter on the NZD/USD charts this week. Review this week's Strategy Webinar for an in-depth breakdown of this setup and more. NZD/USD Daily Price Chart Technical Outlook: In my latest NZD/USD Price Outlook we noted that Kiwi had, 'turned from multi-month consolidation resistance and keeps the focus on a reaction just lower near the 2018 trendline. From a trading standpoint, we'll favor fading weakness while below 6889 - look to reduce short-exposure / possible price exhaustion on a move lower. Ultimately a break below yearly open support at 6705would be needed to validate a larger turn in price. NZD/USD registered a low at 6713 last week before rebounding with price holding just below former trendline support (now resistance) extending off the 2018 lows. Note that daily momentum has continued to defend the 40-threshold as support a break below this level alongside a break below yearly open support at 6705 would be needed to validate the reversal targeting 6633. Initial resistance stands with the 100-day moving average at ~6807 with a breach / close above the monthly open / 50% retracement at 6820/26 needed to alleviate further downside pressure. NZD/USD 120min Price Chart Notes: A closer look at price action shows Kiwi rebounding off Fibonacci support at the 61.8% retracement of the yearly range / February at 6720/22 with the pair nearly completing an outside-day reversal off the lows on Friday. Initial resistance stands at 6781 backed by 6800/07 and 6820/26 a close above this threshold would be needed to keep the long-bias viable. Support and near-term bullish invalidation rests with the 200DMA / lower parallel at 6732- a break below this zone would have us once again targeting the yearly open. Bottom line: Kiwi has rebounded confluence support and we're looking for exhaustion on this recovery just higher IF price is indeed heading lower. From a trading standpoint, the immediate threat may be higher, but we'll favor fading strength towards 6800 with a break below 6722 needed to fuel the next leg lower. Keep in mind we get the release of New Zealand inflation data tomorrow night. Review my latest Kiwi Weekly Price Outlook for a look at the longer-term technical picture. NZD/USD Trader Sentiment A summary of IG Client Sentiment shows traders are net-long NZD/USD- the ratio stands at +2.06 (67.3% of traders are long) bearishreading Traders have remained net-long since April 2nd; price has moved 0.4% lower since then Long positions are1.9% higher than yesterday and 11.0% lower from last week Short positions are 20.8% higher than yesterday and 7.7% lower from last week We typically take a contrarian view to crowd sentiment, and the fact traders are net-long suggests NZD/USD prices may continue to fall. Yet traders are less net-long than yesterday and compared with last week. Recent changes in sentiment warn that the current NZD / USD price trend may soon reverse higher despite the fact traders remain net-long. See how shifts in NZD/USD retail positioning are impacting trend- Learn more about sentiment! Relevant New Zealand / US Economic Data Releases Economi Calendar - latest economic developments and upcoming event risk. Learn more about how we Trade the News in our Free Guide !